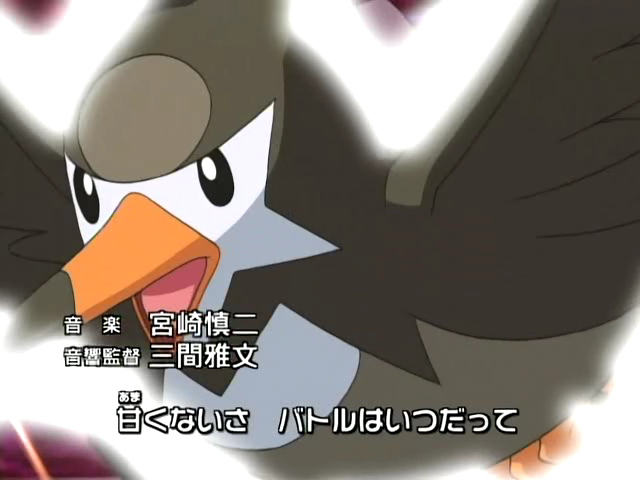 Japanese Episode DP 015: "Kurogane Gym! Hyouta vs. Shinji!!" American Episode 479: "Shapes Of Things To Come!" 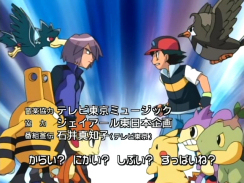 The time for Satoshi's first Shinou Gym Battle has arrived! The young trainer arrives at the gym to challenge the Kurogane City Gym Leader Hyouta, but he learns that Shinji is scheduled to battle before him! 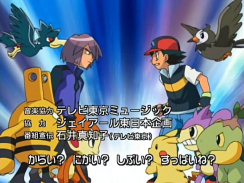 After Satoshi visits Hyouta at the Kurogane City mines, the battle between Shinji and Hyouta begins. 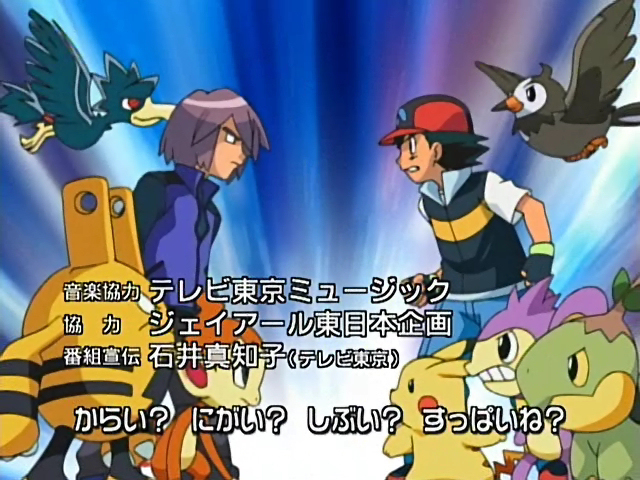 The first match pits Hyouta's Ishitsubute against Shinji's Marilli. Despite the water pokemon's type advantage, Ishitsubute is able to defeat Marilli with a powerful Rollout attack. 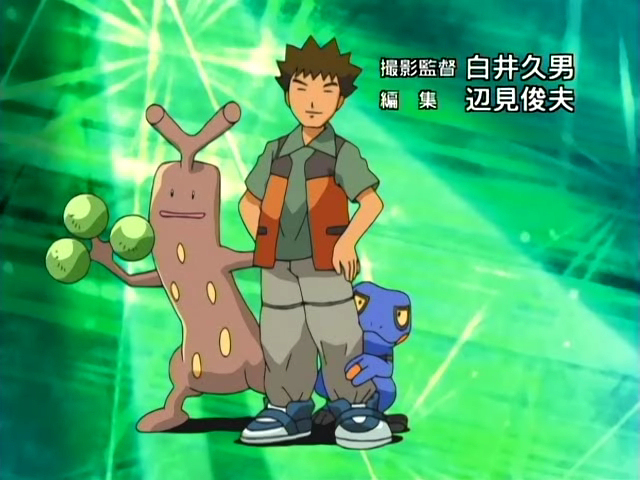 Shinji's second pokemon is his Elekid. 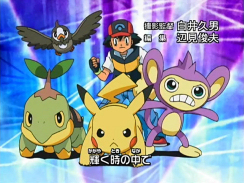 This time, the type mismatch works out in Shinji's favor when he has Elekid use its fighting-type techniques to take out the rock-type pokemon. Hyouta's second pokemon is Iwaku. The rock snake starts off by using Stealth Rock, a technique that damages Shinji's pokemon whenever he switches them out. Elekid is able to successfully paralyze Iwaku, but before long the pokemon's attacks prove themselves to have no effect. Without any other option, Shinji recalls his Elekid and brings out Hikozaru. 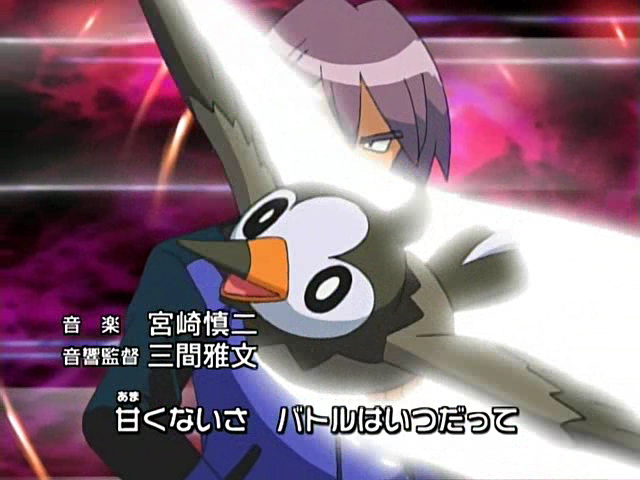 After being struck by Stealth Rock, the fire pokemon uses its Dig attack to knock out Iwaku. Hyouta's final pokemon is Zugaidos, a pokemon with a technique called Zen Headbutt that's able to make Shinji's pokemon flinch. Hikozaru is able to damage Zugaidos' legs before being defeated by a powerful Headbutt attack. Shinji calls on his Elekid again, and after it gets struck by Stealth Rock, the weakened pokemon doesn't seem to have a chance! However, the electric pokemon is able to use Brick Break over and over again until Zugaidos is knocked out! Now that Hyouta's three pokemon are defeated, Shinji is declared the winner! 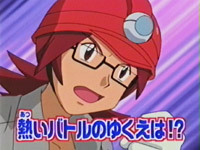 After accepting the Coal Badge, Shinji is told to stick around to watch Satoshi's battle. 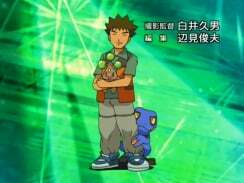 How will the young trainer from Masara Town fare against the Gym Leader Shinji just defeated? To be continued! I really really like the Kurogane arc. I like the fact that the anime showed us Shinji's battle because it proves that he won't be as neglected as Shigeru was. Other high points of the episode are the build up to the Rocket-Dan's big scheme two episodes from now, the insane amount of research into the game mechanics that must have gone into the writing of this episode, Takeshi actually remembering that he had an Iwaku at one point, and the music (well, in the Japanese version, anyway). This easily ranks up there as one of my favorite episodes of the series. I'm glad 4Kids isn't dubbing this show anymore because they probably would have effed up half the game terminology in this episode. I remember they've had problems with Abilities before, so they probably would have screwed them up in this episode as well. In Japan, the shot of Takeshi in the opening theme is updated to include Usokki, while the shots of Satoshi are updated to replace Mukkuru with Mukubird. Sorry about all the pictures, 56K people. The only one of these shots PUSA keeps in the American opening is the final shot, but they continue to use the old animation with Starly instead of updating the opening. This episode has a lot of odd out-of-character comments and remarks that didn't fit the character's facial expression. I know that some of you will see these as examples of me being too nitpicky, but if it stood out when I watched the episode, then I'm going to bring it up in the comparison. First up is Paul's "Duh," which is said after Ash reveals that he didn't know that the Kurogane Gym was a gym for rock-type pokemon. Originally, Shinji doesn't say a thing...he just looks at Satoshi as if he's the dumbest person he's ever met. Next up is Roark's "Uh oh~" after Onix gets paralyzed by Elekid's Static. The dub line doesn't go with Hyouta's expression at all. Originally, he kind of makes an "oh?" sound that shows that he's impressed with the attack. The next line doesn't happen until after the next cut, so I'll deal with it later. We haven't had a good old fashioned commercial cut since the 4Kids days, have we? Basically, the part where Iwaku launches its Stealth Rock attack is played twice in the Japanese version; once before the show breaks for commercial, and again after it comes back. In the dub, this footage is only played once. We get a few more awkward lines. Roark: "When will that Static wear off?" Originally, Hyouta said something to the effect of "So Static hasn't worn off, eh?" While the meaning is more or less the same, Hyouta's line makes him sound more like he knows what he's doing. Roark's line, on the other hand, make him sound like some kind of rookie trainer. The last dialogue change I noticed was Ash's "What a hit!" before Roark explains his Cranidos' Mold Breaker ability. Satoshi wasn't cheering Shinji on in the original...in the Japanese version, he expresses his surprise that Static didn't seem to have any effect. The TO BE CONTINUED... screen is a few seconds longer in the English version than it is in the Japanese version.